In Salt Lake City there are four seasons: winter, spring, summer, and fall. But any true Utahn will tell you that in months like March, April, and even May you might have sunshine one day and snow on another. 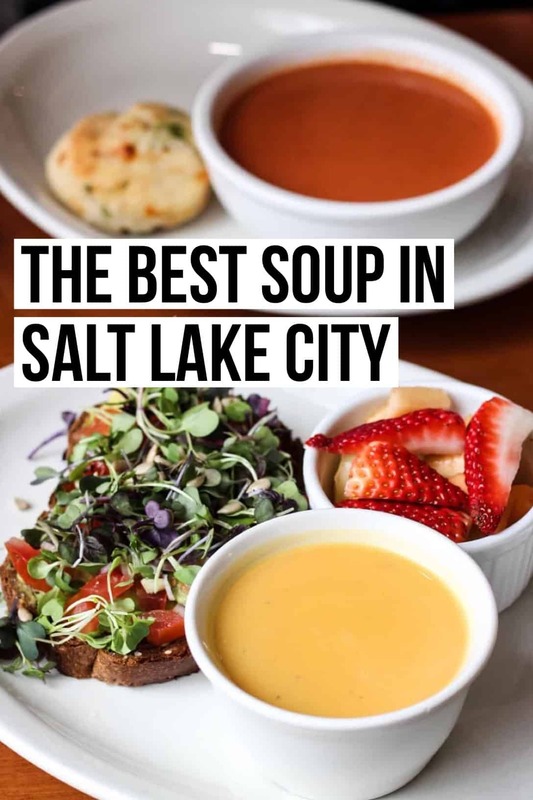 Which is exactly why we felt it imperative to bring you a list of best soup in Salt Lake City, for all of your multi-seasonal needs that beautiful Utah can bring. There’s nothing better than a warm bowl of soup on a rainy spring day or a snowy winter evening, and here we’re sharing our absolute favorites. 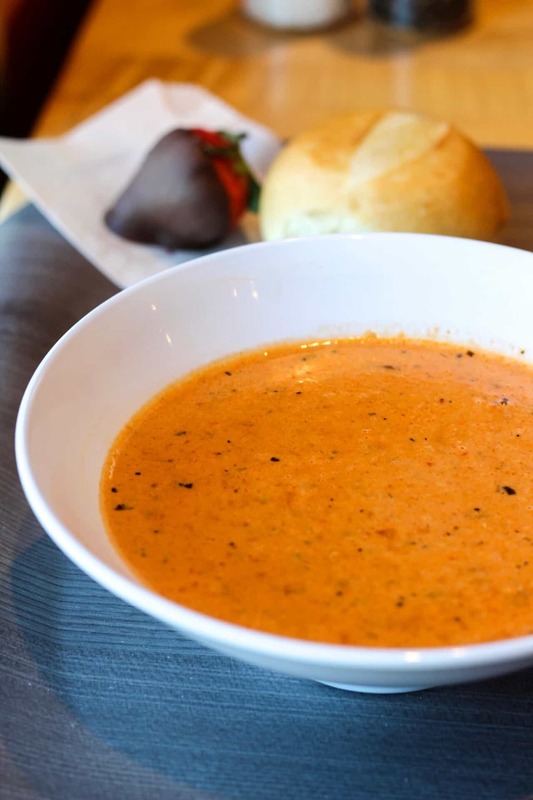 Many people flock to Cafe Zupas, a Utah original, for some of the best soup in Salt Lake City, but the little known star is the roasted red pepper & lobster soup. In fact, many workers assume that we’re ordering the lobster bisque (which is also good) – but make sure to give the roasted red pepper & lobster a chance. The lobster brings a unique and delicious touch to this soup. It’s savory and has a nice little kick to it. And as always at Zupas, a bowl of soup comes with a house roll and a chocolate covered strawberry. 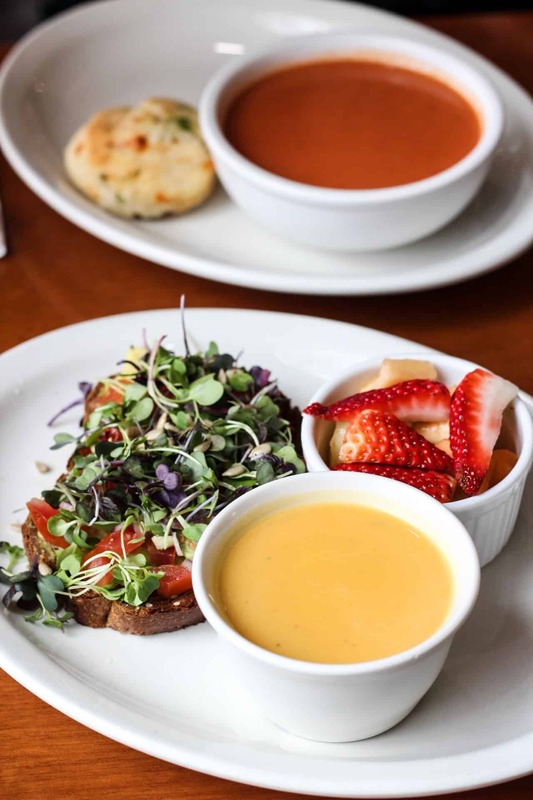 You can also pair your soup with a sandwich or salad in a “Try Two Combo,” which also comes with a house roll and chocolate covered strawberry. Just because Salt Lake City is landlocked doesn’t mean we can’t find a great Clam Chowder in Salt Lake City. Market Street Grill is a prime spot for some good seafood and a fun experience. It’s a busy and popular place, so we recommend getting a reservation before going. The Clam Chowder is our favorite soup to order and it smells amazing. Delicious and warm, it’s always served with sourdough bread, which is perfect for ripping, dipping and savoring. 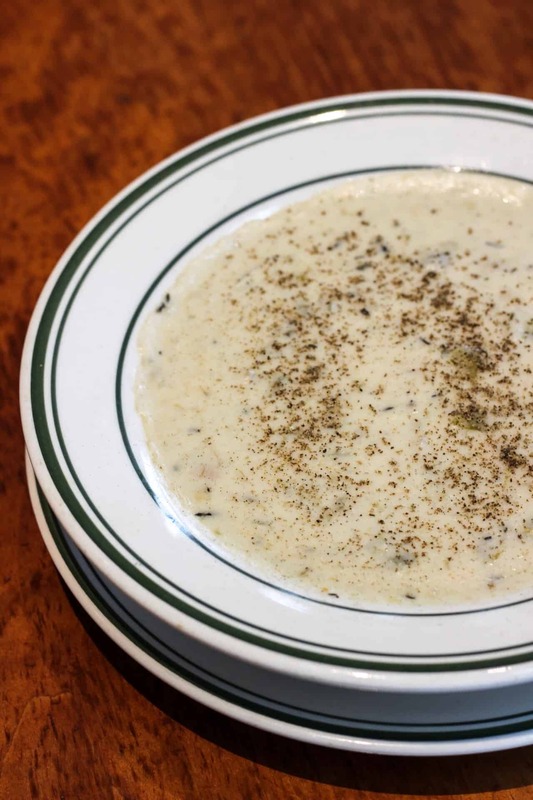 This Clam Chowder will warm you to the bones and it’s some of the absolute best soup in Salt Lake City. Although their menu is often changing, The Dodo Restaurant serves some of the best soup in Salt Lake City- hands down! Soups are always listed on the blackboard (along with the desserts) on the north side of the restaurant. Recently, we ordered a bowl of the squash curry soup and were blown away. It was delicious! The flavors were balanced perfectly, and the toasted coconut on top was an amazing garnish. We also tried a cup of asparagus chipotle clam which was packed with vegetables and had a delicious and fresh flavor. 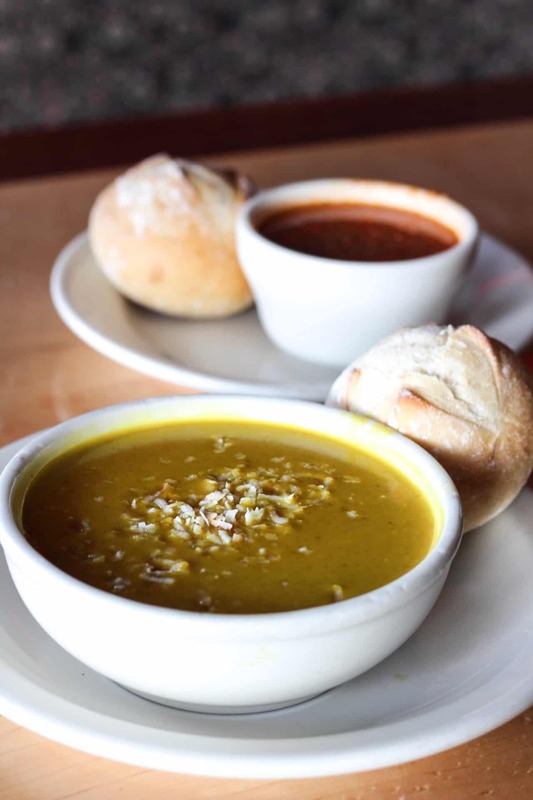 All bowls and cups of soup are served with a tasty house roll. And of all the soup and roll research that we did, this roll was our favorite: semi-hard crust (that won’t destroy the roof of your mouth) with a soft and warm center. 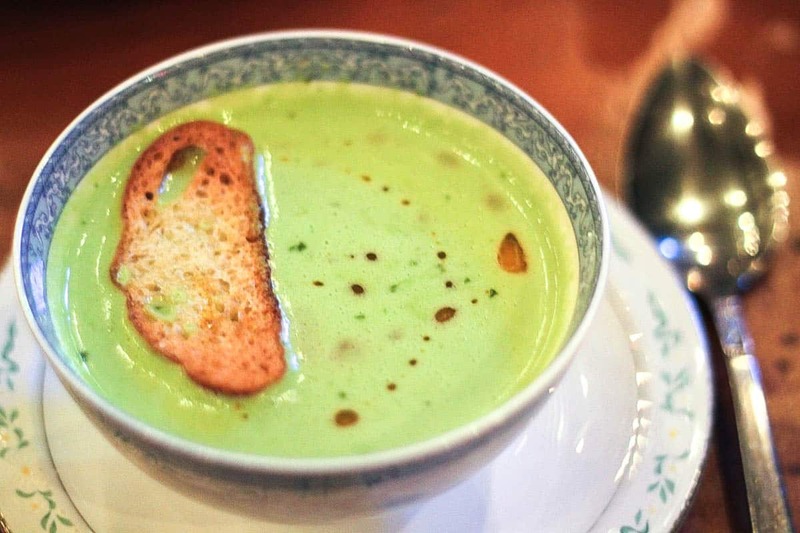 We are definitely fans of the soup at The Dodo and can’t wait to come back! You may never have stepped foot into Tin Angel (although you’ve certain drive past it at least one hundred times on 400 south), but the soup here is reason enough to finally give this charming restaurant a try. Tin Angel is a fun and eclectic Salt Lake City restaurant filled with live music, delicious smells, and a very hospitable staff. The food here is primarily European with a great emphasis on farm-fresh ingredients, but no matter what time of year you decide to come, the delectable spinach and fontina soup will be waiting for you with open arms. The minimalist composition of this soup will blow you away with its incredible flavor and richness- undoubtedly some of the best soup in Salt Lake City. 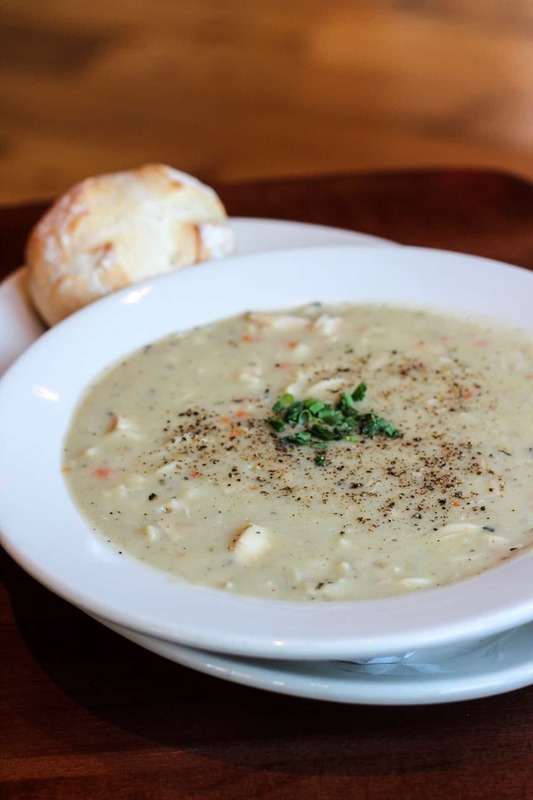 Some of the best food can be found at pubs, like the chicken noodle soup at Porcupine Pub & Grille. If you talk about the best soup in Salt Lake City with just a small handful of locals in SLC, the chicken noodle at Porcupine Pub & Grill will always be mentioned. To our surprise, their chicken noodle isn’t a broth-based soup, which no doubt sets it apart. It comes in a large, shallow bowl and is incredibly creamy and filling. The noodles are cooked perfectly and the entire soup has a nice peppery flavor that isn’t overpowering. Enjoy with their yummy crusty rolls and butter. If you’re looking to warm up with a creamy gourmet chicken noodle soup, make your way to Porcupine Pub & Grille as soon as you can! Food for Thought is a cute and cozy cafe that’s located in the middle of a charming neighborhood, right by a beautiful park. This is a fun little place for breakfast or lunch that serves soups, salads, sandwiches, and pastries. When looking for a warm and toasty soup, order their parmesan tomato, which is creamy and more gourmet than your typical tomato soup. We’re also huge fans of the Roasted Butternut soup. It has a pure butternut squash flavor to it that isn’t overpowered by spices or other additions. A bowl of soup at Food for Thought comes with a yummy cheddar and scallion biscuit, or you can choose to have a smaller portion of soup with a sandwich or salad of your choosing. A lesser-known gem in the valley and one your top options for the best soup in Salt Lake City! Our absolute favorite bowl of soup in all of Salt Lake City is the french onion soup from Desert Edge Brewery, otherwise known as “The Pub”. Everything about this soup is delicious, cozy, savory perfection, from the beef broth to the silky onions to the copious amounts of Swiss cheese melted and broiled on top. Don’t let anyone tell you that another restaurant in the valley makes a better french onion, because we’ve tried them all and this bowl is king. 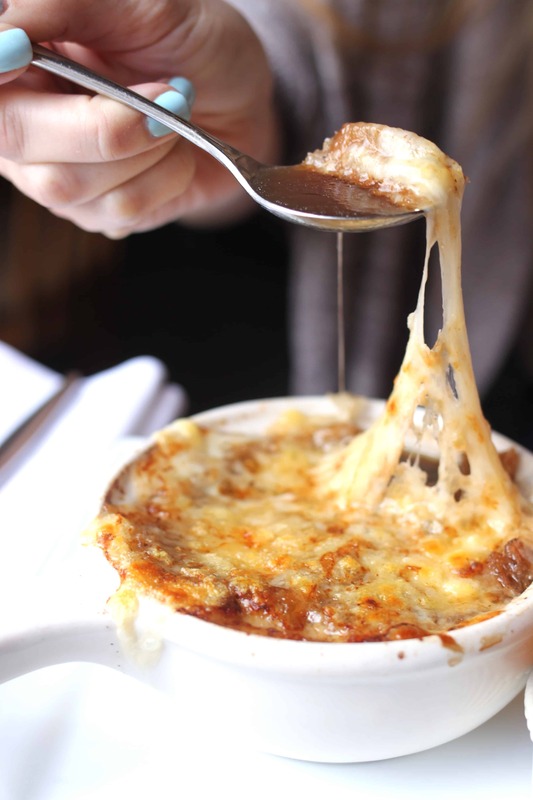 You can also enjoy this amazing french onion soup at Desert Edge Brewery’s sister restaurants, Red Butte Cafe, Martine, or the Stella Grill. The soup for all of these locations is made at The Pub and prepared with the bread and cheese when ordered at each restaurant. Unquestionably the best soup in Salt Lake City in our book. Curious if you guys went to The Soup Kitchen in Sugarhouse. . .on 1100 East just north of 2100 South. It’s absolutely a Salt Lake classic, and has been there since the 70’s. I grew up going there at least once a month in the winter for a Saturday afternoon lunch with my parents, and the soup and breadsticks were always amazing! I haven’t been back in a few years, so I’m wondering if it’s still good. If you haven’t been, you should go and review, just since it’s such a SL institution! Hi Kara! Yes we did include them in our research for this post. 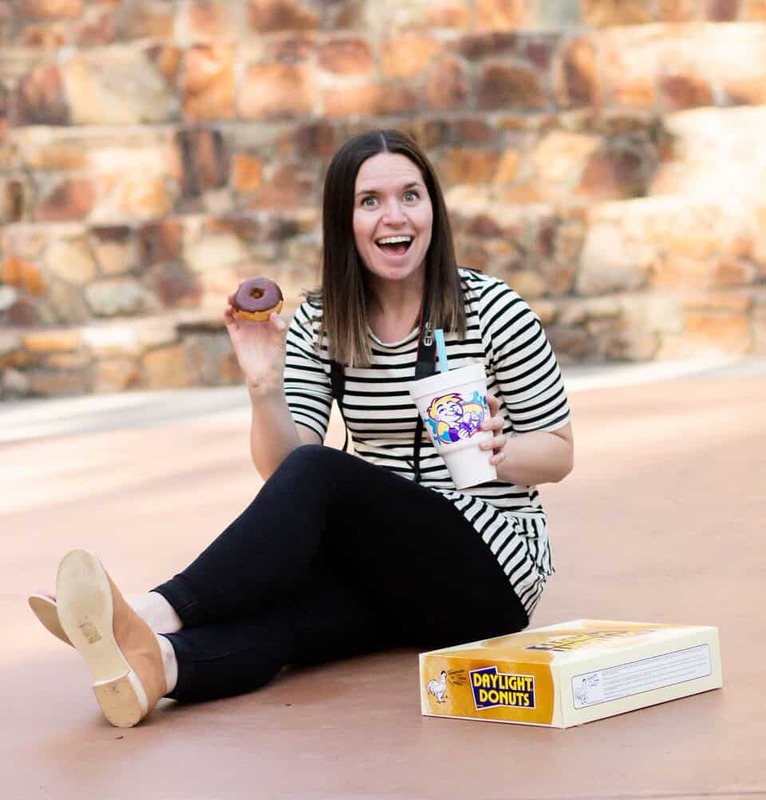 We ultimately decided not to include them because, although they’re one of the most popular places for soup in SLC, we decided to only include our top choices. Appreciate your feedback and thank you so much for reading! You didn’t put soup kitchen on this list?! We know that Soup Kitchen is an SLC favorite but ultimately decided to not include them. True to all of our posts, we only share our top recommendatinos. Thanks for reading!